Pictured (L-R) are Pauline Caumont, Executive Secretary of the Atlantic Arc Commission, Francisco José HUIDOBRO, Vice-president of the Réseau Transnational Atlantique – Atlantic Transnational Network, Ramón JÁUREGUI ATONDO, Member of the European Parliament, Iain SHEPHERD, Acting Head of Unit Atlantic, Outermost Regions and Arctic, Directorate General for Fisheries and Maritime Affairs, Marcella SMYTH, Chair of the Atlantic Strategy Group, and Jorge García REIG, Subdirector General de Programación Territorial y Evaluación de Programas Comunitarios del Ministerio de Hacienda y Administraciones Públicas. 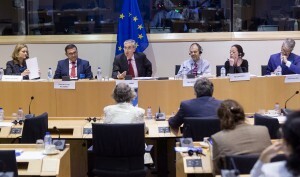 The European Parliament’s SEARICA intergroup, together with the Atlantic Strategy Group, organised a roundtable discussion on 14 June to discuss plans for the implementation of the Atlantic Action Plan. The meeting, entitled “Seas in Motion – Activating the Atlantic Action Plan”, brought together a number of partners involved in the implementation of the Atlantic Strategy – including Member States, MEPs, Regions, European institutions, civil society and Atlantic networks – to discuss the state of play regarding the Strategy, as well as possible ways of cooperation in the field of research and innovation in the Atlantic. The first session focused on the development of the Atlantic Strategy and the role it plays in fostering maritime economy. The European Commission and the Atlantic Strategy Group outlined the history of the Strategy and reiterated the importance of the Support Team for the Atlantic Action Plan, which was set up in 2014. Marcella Smyth, Chair of the Atlantic Strategy Group and Maritime Attaché of the Irish permanent representation in Brussels, stressed that the Support Team is now focusing on concrete actions to accelerate the implementation of the Action Plan. Pauline Caumont, Executive Secretary of the Atlantic Arc Commission (AAC) presented the role of the Atlantic Arc Commission in the development and implementation of Atlantic Strategy in the first session. She advised that the Atlantic Arc Commission has promoted the Strategy and been closely involved in the development of its Action Plan. She also expressed the concern of the Atlantic Arc Commission’s member regions regarding funding for the implementation of the Strategy. The European Commission recently informed Atlantic Strategy Group members that the specific budget it was planning to earmark for the implementation of the Strategy within the EMFF work programme 2017-2018 was not guaranteed anymore. The Atlantic Arc Commission considers this to be a backward step that undermines efforts to implement the Strategy. An official letter, signed by the President of the Atlantic Arc Commission, Bruno Retailleau, has been sent to Commissioner Vella to raise the issue. During the meeting, the Atlantic Arc Commission also disseminated its 2016 Final Declaration “Pamplona 2016”, which was adopted on 3 June 2016.